Location: Nr Naul, Co. Dublin, Ireland. Grid Reference: 53° 35' 44'' N, 6° 19' 43'' W.
Only 5 miles from Tara-Hill, and directly in line with the passage at Newgrange, this is the last remaining of three passage mounds (similar to the Boyne-valley). The several engraved lintel-stones inside the mound reflect an importance to this site that has yet to be realised. The remains of three chambered cairns were found on the same hill but 'Fourknocks' was the only mound to be restored. This greatly restored passage mound is accessible by asking a locals for the key (see notice-board at site). 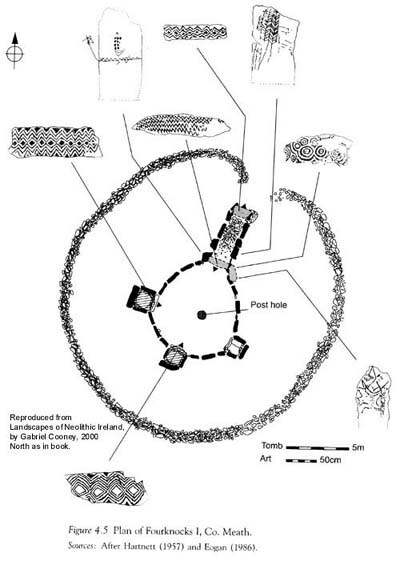 Inside the passage mound, the visitor is rewarded with a cruciform passage and chambers, leading from the large central space (The largest in Ireland at 42m²), considered too large for an original stone roof, and therefore thought to have been originally surmounted by a wooden one. Fourknocks was excavated in the 1950s by P.J. Hartnett, and the greater area was investigated again in 1982. 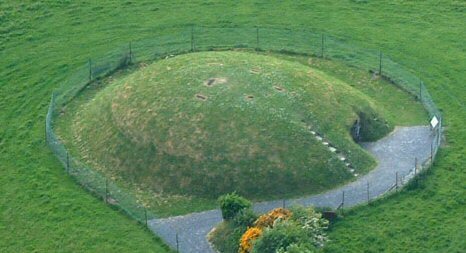 It was reconstructed with a concrete roof and covered over with a mound, giving it the same look as the Mound of Hostages on Tara Hill. The original mound was 19m in diameter and was surrounded by a dry-stone kerb-wall. 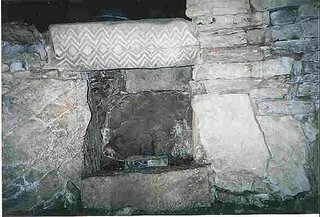 Decorations - This un-kerbed passage-mound contains three carved lintels (one over each recess), with a total of 12 decorated stones. 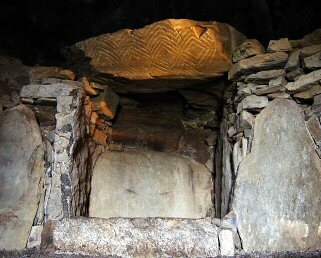 The style of art and placement of these lintel-stones has been compared to Newgrange and Gavrinis, in France. Apart from one example, all the decorated stones at Fourknocks are green gritty sandstones. 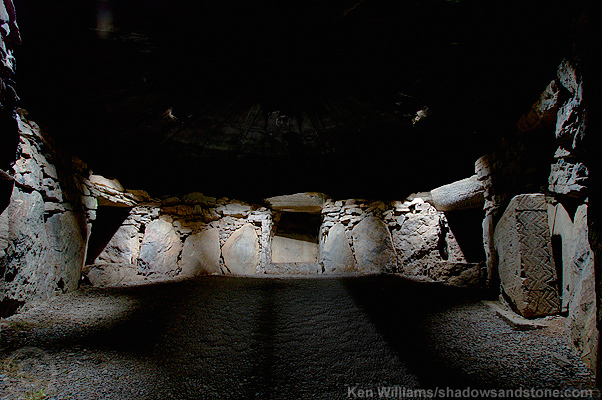 The chamber is cruciform, along with several other Irish passage mounds. Decorated lintel-stones (left: Southern recess - right: Western recess). This lintel-stone once sat over the entrance of the mound. 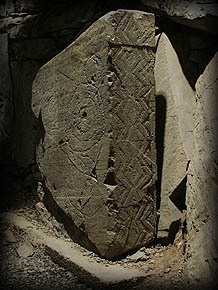 The 'Face' (left), and another engraved lintel-stone (right). Could this be the missing lintel stone from the eastern recess..? 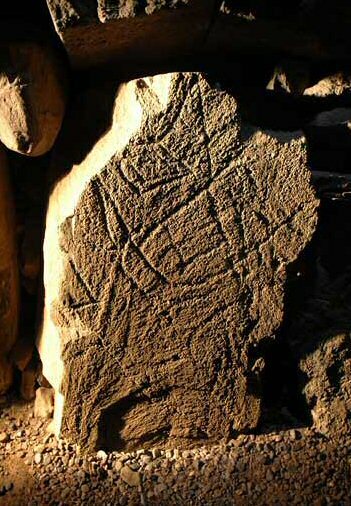 Archaeo-astronomy - The passage is orientated to 17° degrees east of true North, a feature which is also curiously present at several Pre-Columbian structures, and suggestive of a preference of orientation towards a star or other object, rather than the more common orientation towards prominent phases of the cycles of the sun and moon. Fourknocks is said to be in direct line with the passage at Newgrange, although it is ten miles distant and not inter-visible... In other words, if one follows the path of the midwinter sun as it passes over Newgrange, it will lead you directly to Fourknocks. Fourknocks lies on the same latitude as Tara Hill (suggesting a possible equinoxial alignment)..